Spencer Soper of Bloomberg wrote about changes inside of Amazon retail - the retail veterans who once decided what to sell on the site have lost out to the marketplace data scientists. Spencer’s story focuses on algorithms automating previously manual retail tasks like forecasting demand, ordering inventory and negotiating prices. It is interesting to see Amazon reorganize their oldest, the original, side of the business. The retail group is being merged with the marketplace. Algorithms are replacing vendor managers. These changes are foreshadowing the inevitable disappearance of the retail business, also known as first-party, inside of Amazon. It’s well known that powering the Amazon shopping experience there has always been two competing strategies: retail and marketplace. One focused on having the best deals and terms from vendors, another on enabling sellers to succeed. The retail side used to have tools and services not available to sellers on the marketplace. Advertising for example first launched for retail vendors and so did many other branding features. But over the last few years those advantages started to disappear as the marketplace got the same perks. “We’ve been working for some time on standardizing the products, tools and services we offer to the brands and resellers that sell on Amazon, and have made some organizational changes as a result,” Amazon said in a statement. Amazon has gone through these changes because the marketplace is growing faster than their own sales, has less inventory risk, and is more profitable. Bloomberg wrote that the marketplace profit margin is 10% versus 5%. Amazon fundamentally changed over the last two decades - initially faced with reluctance to sell from major brands, now brands often have no choice but to sell on the platform. Increasingly so as sellers on the marketplace, not by selling to Amazon as vendors. It can be argued that the only reason Amazon retail exists is because many brands are only fit to do wholesale. Some of the largest brands still feel more comfortable selling wholesale, but the growing industry of Amazon brand agencies ready to guide will soon fix that. Outside of that there is nothing vendor managers do better than sellers on the marketplace. In the end it’s all about forecasting demand, listing products online, and managing inventory. Although selling wholesale is a different business model so the future of brands not needing retailers is far away. The marketplace became the driving force over the last decade largely thanks to Fulfillment by Amazon (FBA) launched in 2006 enabling the fly wheel of low prices, large selection, and Prime. The remaining question is for how much longer will Amazon continue to operate the original retail business. In 2020 the Amazon marketplace will celebrate its 20th birthday, will the retail business still exist when it hits the 30th birthday? Amazon’s focus on retail has shifted to new areas instead, like building their own brands. Which puts them at a complicated position running the most visited e-commerce website in the US where they sell goods bought wholesale, goods they make themselves, and also goods listed by third-party merchants. The search and buy-box algorithms clearly prioritize Amazon’s own initiatives, making many bring up anti-trust questions. Over time questions about fairness on the platform will only get louder. 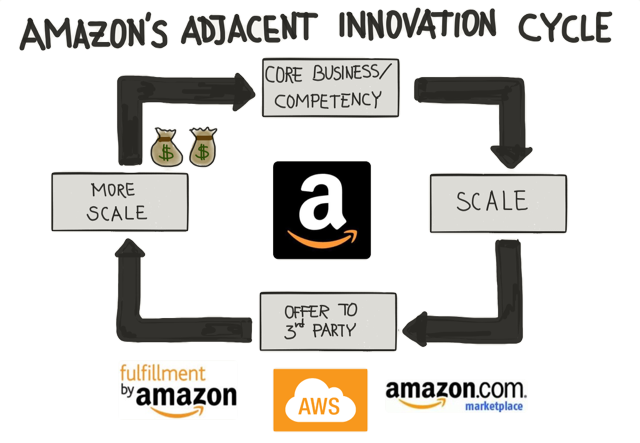 So much of what Amazon is today is a company of scalable systems. Zack Kanter in “Why Amazon is eating the world” on Techcrunch wrote: “Each piece of Amazon is being built with a service-oriented architecture, and Amazon is using that architecture to successively turn every single piece of the company into a separate platform - and thus opening each piece to outside competition.” The retail business doesn’t fit this vision. It’s already a mistake to call Amazon a retailer because they do so much more. And yet most of their revenue comes from retail sales, despite that segment growing at an all-time-low 13%. There is not going to be an abrupt stop in selling as a retailer, but Amazon’s future is building platforms. Which finally, after two decades of being in the red, are profitable.